In the new Delta Toronto 42 stories above the downtown core, Ahmed Amer, area systems director of IT in Ontario for Marriott Hotels, stands in front of a 55-inch curved HD TV and shows pictures of his kids to a couch full of journalists. After a tour of the luxury suite that included a bathroom with a tub nestled into a corner with floor-to-ceiling windows yielding a panoramic view of Toronto’s island airport, lakefront, and the Rogers Centre, Amer invited reporters to sit down in the living room to ogle the new entertainment centre. The big TV is just the end-user component of a new solution designed by Samsung Electronics Canada specifically for this 567-room, four-star tower that offers the highest hotel rooms available for rent in the city. 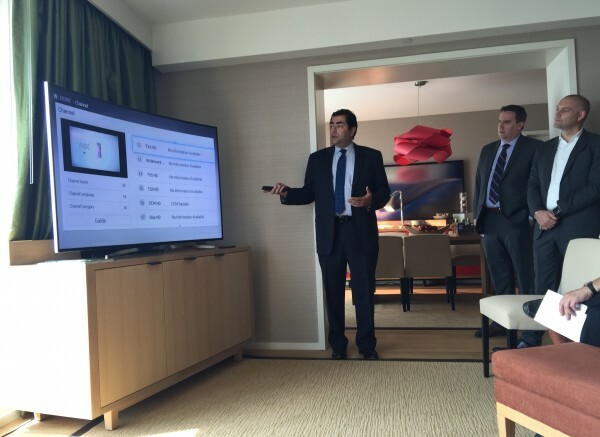 It’s more than a TV, Amer explains, it’s the guest’s user guide to the hotel’s services and an interface offering a large screen for their personal smartphones, tablets, or laptops. Using his Android smartphone (in the Samsung Galaxy line), Amer demonstrates how he can display any content he has downloaded to his phone on the large TV. With a few taps, pictures from his last family vacation are up on the screen. Some suites in the Delta Toronto offer a bath tub with a view. For Samsung the opportunity to contribute an entertainment system to the new Delta Toronto, one of the largest hotels in Canada and having just opened late last year, was an important one, says Stephen Perkins, vice-president of display business for enterprise at Samsung Canada. The solution turned out to be Samsung’s Lynk-Sinc service. While it’s available at other hotels, including the Delta Waterloo, Samsung spent time customizing it for this deployment. At its core, the system is a digital IP-based system that gives hotel staff the ability to control the guest experience on the TV in each room. In the IT nerve centre, tucked away in a discreet room near the underground parking garage, a blade server is dedicated to Lynk-Sinc. On the ground level, staff use a computer in a back room connected to a separate box to program the content that will appear on the TV screens. From daily room service menu updates to messages that can be targeted to specific rooms, updates are completed in a similar fashion to updates made to a web page with a content management system. Pushing the information to the TVs is instantaneous, and each TV will pull updated content from the system each time its turned on. Samsung, a brand known for its line of consumer electronics, has been expanding its area of business in hospitality and new residential multi-unit buildings. Lynk-Sinc is one of three systems that it currently offers to hotels – the modern form that takes advantages of new hotels wired to with IP systems. Another system, Lynk-Reach, is designed for hotels still reliant on analogue-based technology. Currently in development is Lynk-HMS. That product is being piloted with partners in Western Canada currently, he says. At the moment, the Lynk-Sinc solution is available, priced in the ball park of 50 cents per day per hotel room. That includes the television and the content delivery system. This new Delta tower is part of an effort to bring this Marriott to be seen as a more upscale hotel option. Most Delta hotels are rated at three stars, but this one is the full four stars. In addition to bathtubs offering panoramic views, that offers a special touch for each guest, Amer notes. “You need to make sure you’re delivering a personalized service that will please each guest,” he says. The collaboration led to Delta also updating its Waterloo location with the same system. It plans to continue to deploy the system to all Delta locations across Canada. Ahmed Amer, area systems director, IT for Ontario at Marriott, demonstrates the in-room technology found in the new Delta Toronto. Amer says plans to improve the system don’t stop there. The hotel is currently working to integrate Lynk-Sinc with its third-party guest management system so it can offer check-out from the TVs. While wirelessly streaming content like Netflix is prohibited by those vendors due to copyright restrictions, Marriott is currently in negotiations with Netflix to allow this – so no cable will be required. “We don’t want to overcomplicate things for the guests, so we try to simplify it as much as possible,” he says. And by the way, the WiFi at the Delta Toronto comes included. There’s no extra fee, even 42 storeys up.